In the art business since 1993 when we got established, our definitive collection represents the expanse of Indian art practice over the 20th century, covering periods, styles, themes and artistic concerns. The collection showcases artists from early twentieth century, the range of significant modern practices from all significant art centres of the country, whether Bombay, Calcutta, Delhi, Baroda and the many centres of the south. While the focus is on the modern period, the DAG art collection also showcases the work of some of the most celebrated travelling European artists from the seventeenth century onward. The gallery’s Indian modern art collection closely follows contemporary Western art movements, tracing thematic parallels. The DAG collection charts a historic continuum: from artists such as Raja Ravi Varma, early century academic artists trained in Bengal and Bombay, those as J. P. Gangooly, N. R. Sardesai and others. The modern period is led by those such as Amrita Sher-Gil, the Bombay Progressives, including the likes of F. N. Souza, M. F. Husain, S. H. Raza, K. H. Ara, associates as Krishen Khanna, Ram Kumar, Akbar Padamsee, V. S. Gaitonde or Tyeb Mehta; modernists from Bengal such as Ganesh Pyne, Chittaprosad, Ganesh Haloi, Bikash Bhattacharjee; significant modernists from Baroda, such as Gulammohammed Sheikh or Jyoti Bhatt; those from the south such as K. C. S. Paniker, Laxma Goud, P. T. Reddy or T. Vaikuntham, or names such as J. Swaminathan and Avinash Chandra. Our extensive collection provides a critical link for art lovers, academicians and researchers, to collectors and investors. DAG has utilised this extensive collection to mount acclaimed artist retrospectives and thematic exhibitions noted for their historicity and rigour of research. These include first-ever retrospectives of artists such as Chittaprosad, Avinash Chandra, Rabin Mondal and G. R. Santosh; thematic exhibitions on art from Bengal and Santiniketan, those on the genres of landscapes, abstracts and mythological art, and those tracing the legacy of significant artist collectives such as the Progressive Artists’ Group and Group 1890. DAG participates in national and international art fairs of repute such as Art Dubai, Art Basel Hong Kong, Art Stage Singapore, Masterpiece London and India Art Fair (New Delhi). Our presence at these venues has brought attention and awards for its innovative pavilion designs and curated presentation of select artworks. At the fairs, DAG has run a consistent programme of art outreach to school and college students and corporates, which includes the pioneering use of tactile aids that create access to art for the visually disabled. DAG has its flagship gallery in Hauz Khas Village in New Delhi and a gallery space in Mumbai, in the historic Kala Ghoda area. It opened its first international location in New York in 2015, in the historic Fuller Building in Manhattan where it continues to hold exhibitions to great success. Expanding its global and national presence, DAG is committed to take Indian modernism to new audiences and present significant, historical world class exhibitions. Ashish Anand’s journey into the world of art began in 1996. 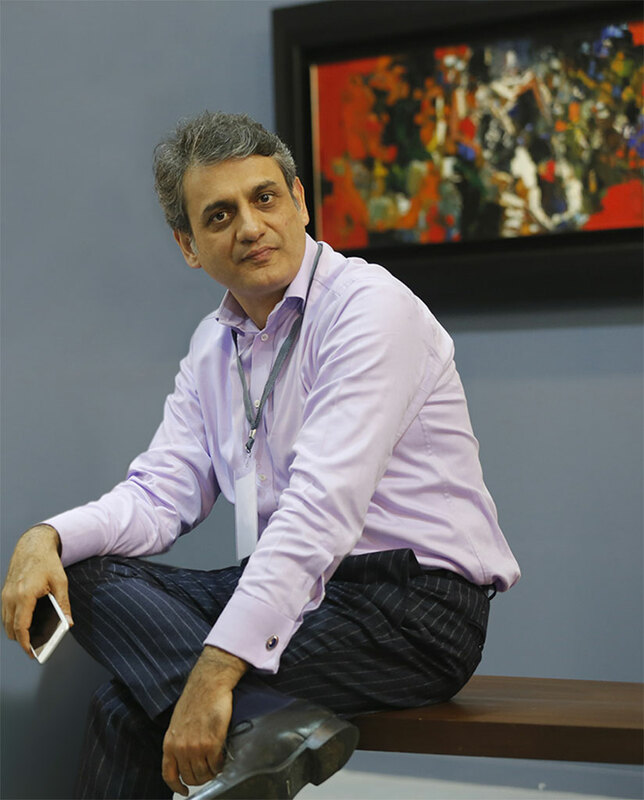 With over twenty years of expertise in the field of modern Indian art, he has successfully managed to promote and showcase it in an unparalleled format. Anand is known to have built the most formidable collection of artworks over the years, creating an unparalleled repository for DAG. With its flagship gallery based in New Delhi, 2013 marked the opening of DAG in Mumbai in a heritage building with an iconic show titled Mumbai Modern, and in 2015 the organisation expanded its activities to New York, inaugurating its gallery in the prestigious Fuller Building. The gallery’s vibrant programme features the work of leading modernists including Amrita Sher-Gil, Tyeb Mehta, F. N. Souza, M. F. Husain, S. H. Raza, Rabindranath Tagore, Nandalal Bose, and several hundred others. Additionally, historical exhibitions of significance and pivotal to the history of Indian art have been curated by DAG and include Continuum: Progressive Artists’ Group, The Art of Bengal, Indian Landscapes, The Art of Santiniketan, India’s Rockefeller Artists, Group 1890: India’s Indigenous Modernism, Indian Divine, Memory & Identity: Indian Artists Abroad, India Modern, among several others, including retrospectives of major artists. DAG’s participation in fairs includes, among others, India Art Fair, Art Dubai, Art Basel Hong Kong and Masterpiece London. The gallery also publishes scholarly exhibition catalogues and artist monographs. DAG has provided instrumental support to many institutional exhibitions including at Documenta Kassel, Shanghai Biennale, Punjab Lalit Kala Akademi, Chandigarh, Jawahar Kala Kendra, Jaipur, Bhau Daji Lad Museum, Mumbai, and the National Gallery of Modern Art in New Delhi and Mumbai. Anand continues to actively commit his time to promoting the arts of India.